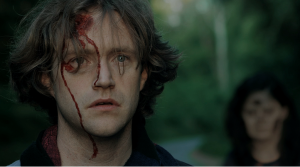 My guest this episode is actor Conor Marren. Conor is the lead from Randall Plunket‘s short horror film Out There, which Randall talked about on episode 11. Out There has been selected for Canne, so before he flew off Conor stopped by to talk about it, other films he’s done and some of his favourite horror films. Films discussed: The Shining, Zombieland and The Wicker Man. Check out Conor’s showreel etc here.